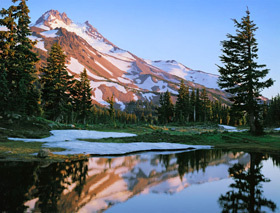 Mount Jefferson, Mount Jefferson Wilderness Area, Oregon Cascades, Oregon, copyright 1959 by Philip Hyde. Cascade Pass was closed, but Steven’s Pass proved nearly as direct to Lake Chelan. After arrival at Lake Chelan, Ardis and Philip woke up about 5:00 am on July 9 to arrange their gear and catch the Lady of the Lake, a small passenger liner ship, which would take them 55 miles from Chelan at the lower end of Lake Chelan to Stehekin at the upper end of the lake. In Stehekin they ate a “delicious lunch in a coffee shop and met Phil Berry, Sierra Club Pack Trip leader.” The pack trip into the North Cascades started up the Park Creek trail by around 3:30 pm. Participants in the pack trip included David Brower and his sons Bob Brower and Ken Brower, as well as Kathleen Revis from National Geographic. Spring was just reaching the high country and the trail of nearly six miles was all in the shade in the late afternoon. The hike was “frigid,” Ardis Hyde wrote in the travel log. On another day of the trip they had more than a glimpse of Glacier Peak as they climbed to Image Lake and looked across the deep glaciated valley for a dazzling view of the huge mountain. When they returned on foot to Stehekin they took a plane ride to view from the air some of the country they had hiked. 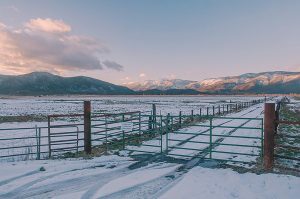 They visited Sierra Club leader Grant Mc Connell’s famous homestead cabin, as well as Hugh Courtney’s perhaps more locally famous homestead cabin that had been built in 1906. Hugh Courtney had arrived in 1917 and added onto the cabin. Saturday, July 18, 1959: We stopped at Hugh Courtney’s Cabin to take a picture of it in morning light. He showed us old photos of Lake Chelan and the town of Stehekin with lake boats in the early 1900s. We drove the Avery truck into Stehekin and talked at length to Harry Buckner about park and development proposals for the area. We boarded Lady of the Lake and arrived at the far other end of the long, narrow Lake Chelan. The heat on the lake from here to Wenatchee was disagreeable, but we spent the night in an air-conditioned motel. Sunday, July 19, 1959: During the morning until 11:00 we worked on reorganization, laundry and re-loading film. The drive from Wenatchee to Timberline Lodge was scorching hot all the way. Crossed the Columbia River at the Hood River Bridge. It was 107 degrees Fahrenheit in Hood River. We reached 6,000 feet in elevation around 7:15 pm on the slopes of Mt. Hood, where we had a good view of Mt. Jefferson. Bear Grass was in bloom. After dinner in the lodge we spent the night in our pickup parked on the dirt road leading into the timberline trees just below the lodge. It looked light like a forest fire was burning to the South. Monday, July 20, 1959: In our pickup we headed past Olallie Lake to Breitenbush Lake where we made a base for tomorrow’s backpack into Jefferson Park. Breitenbush Lake is especially beautiful, shallow with grassy irregularities in the shallows, bordered with bear grass at one end under a mountain peak. Breitenbush Lake is set in a large, open meadow with an almost groomed park like appearance under the full moon. Tuesday, July 21: Off for a six-mile hike into Jefferson Park. It started out as an easy climb, but the trail traversed much snow near the top of the ridge overlooking Jefferson Park. Deep red paintbrush grew in patches and the pink and white heather were abundant. An impressive number of small lakes and puddles of snow water are forming near the top of the ridge. The entire area was inviting and lovely as mounds of snow melted into the forming water depressions. We made a long, one-mile descent into Jefferson Park, which was filled with snowmelt depressions all over, with one large lake. Dirty campsites had marred the water. So we picked an open place on the heather for sleeping bag sites. We made our own fireplace on a patch of dirt near the trail and took water from a pothole. Mosquitoes were so abundant we could never relax. We were grateful we had brought netting, which we mounted over our heads during the night. Our campsite was in full view of Mt. Jefferson, which rose in the North and towered over us. Wednesday, July 22: Up at 5 am to get an early start for it is a hot day and night on the trail at 6:30 pm going straight up ridge rather than by trail traversing the slope. We lingered on the other side of the ridge for more pictures of lively snow melt pockets. In retrospect these little water gems were the prettiest art we saw. We had the whole park to ourselves until on the way out we met a party going in. On the way out we also encountered a group of botanists from Oregon State. We reached Breitenbush Lake about 11 am. Last part of the trail was very hot over sunny open spaces. We packed up and left in the afternoon coming out to the Santiam Highway and then going onto a dirt road again at Clear Lake. We stopped at Sahale Falls for a look, but the light was gone. Went on to Koosah Falls. Decided to camp at Koosah Falls and get both falls in morning light. Across the road was well-framed ice cap springs. Clouds were forming too. Thursday, July 23: Overcast and some sprinkles of rain. Philip photographed both falls, especially lovely in their red cedar dense and lush forest setting…. Stefan Kirkeby, gallerist of Smith Andersen North Gallery, said over 250 people attended the Philip Hyde exhibition opening this last Saturday evening, January 25, 2014. Included in the crowd were Ken Brower–history making editor of Sierra Club Books and National Geographic writer and author of several books, Sierra Club Calendar and mountaineering photographer Ed Cooper, Golden Decade photographers Stan Zrnich, Gerald Ratto and David Johnson, who each have significant accomplishments of their own, Jack Fulton department head and associate professor of photography at the San Francisco Art Institute, Jeff Gunderson co-author of The Moment of Seeing: Minor White at the California School of Fine Arts, black and white architecture and landscape photographer Mark Citret, contemporary landscape photographer Gary Crabbe–protegé of Galen Rowell, a Sonoma County winery owner and other collectors, photographers and fans of photography. “It was our largest show opening since the Golden Decade,” said Stefan Kirkeby. The Golden Decade in West Coast photography refers to the first 10 years of Ansel Adam’s photography department at the California School of Fine Arts, now the San Francisco Art Institute when Minor White was lead instructor and other teachers included Edward Weston, Imogen Cunningham, Dorothea Lange and Lisette Model. The Golden Decade exhibit at Smith Andersen North drew over 500 people and exhibited the work of over 20 of Philip Hyde’s contemporaries. “This Land Is Our Land: Philip Hyde And The American Wilderness” exhibition will run through March 1, 2014 and consists of vintage color dye transfer and Cibachrome prints, original vintage black and white silver gelatin prints, contemporary black and white darkroom prints from Philip Hyde’s original 2 ¼, 4×5, 5×7 and 8×10 negatives, and photographer authorized archival chromogenic lightjet and inkjet digital prints. Stefan Kirkeby opened the evening’s talk by recognizing the commitment and dedication of Philip Hyde to preserving wilderness through conservation photography. He introduced David Leland Hyde, who first recognized Stefan Kirkeby’s dedication to art and artists. Then Hyde spoke about his father’s various campaigns and what it was like growing up with a father who was on the road 100 days out of every year for nearly 60 years. The young Hyde spoke of his good fortune to have traveled with his mother and father on many of their outdoor adventures. He told the story of traveling to a small wild island in the Caribbean as part of an assessment of whether or not to protect the island and it’s unique native species and endangered species in their home habitat, or to maintain the island as a US Navy bombing range. David Leland Hyde described landing in a small plane in a grass field on Isla Mona, the island off Puerto Rico, driving through the jungle, staying in small beach bungalows, snorkeling in shallows filled with multi-colored fish that stretched for miles, backpacking across the hot desert interior of the 10-mile across island, hiking along the beach, camping near a Korean War era plane crash, befriending a four foot iguana, visiting a bat cave and getting up in the middle of the night with his parents and naturalist Frank Wadsworth to see the Southern Cross gleaming overhead in the clear milky way decorated night sky. Ken Brower spoke next about the collaboration between his father, environmental leader David Brower, and his “go-to” photographer, Philip Hyde. 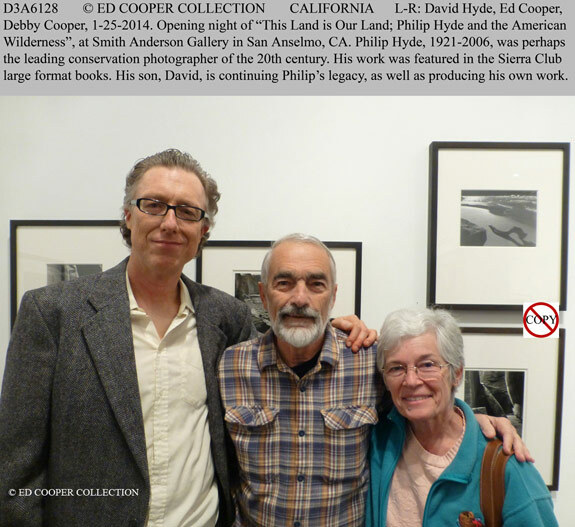 Ken Brower told the story of David Brower and Philip Hyde having traveled to Hetch Hetchy Reservoir together in 1955 to photograph and motion picture film the low water that revealed the devastated dusty field of stumps as depicted in Philip Hyde’s famous photograph of the same title. Ken Brower also talked about other conservation campaigns and how art ultimately can make a big difference in the world. The atmosphere in the gallery during the opening was festive and lively with plenty of refreshments including a selection of several types of white wine. You have never before seen gallery opening finger food cuisine like this: toothpick strawberries, kiwis, raspberries, grapes, cantaloupe, brie and three other types of cheese, four types of crackers, raspberries, cantaloupe, Shrimp Spring Rolls and sauce, both made on location, as were fresh Pico de Gallo with two types of chips and much more. Besides being the first large photography exhibition of Philip Hyde’s work in nearly 20 years in the Bay Area, “This Land Is Our Land: Philip Hyde And The American Wilderness,” will run through March 1, 2014 and display the various regions in which Philip Hyde photographed and helped to protect wilderness.